Overconfidence brought disappointment, and could signal a new direction in relations. It is a truism to say that East Asia today is at a major turning point, given the rise of China as an economic and military power, the long-term economic downturn in Japan, and the waning relative power of the United States. The United States, long the dominant power in the region, is now squaring off against an increasingly assertive China. The countries caught in the middle are trying to find their own position. This change in the balance of power in East Asia does more than simply trigger tensions between the U.S. and China themselves. Depending on developments, tensions between those two great powers will have repercussions for the position of the East Asian countries caught in the middle. This most dramatic manifestation of this could well be seen on the Korean Peninsula. In East Asia, the Cold War was a confrontation between the land powers of the Soviet Union and China, and the maritime power of the United States. South Korea, established on a narrow strip of land on the southern part of the Korean Peninsula situated at the eastern end of the Eurasian Continent, was one of the few places where the United States directly confronted the mighty land powers of the Soviet Union and China. For the U.S., South Korea is the most difficult region in East Asia to defend militarily. The Korean Peninsula has thus been in a constant state of military tension. This poses a significant threat to neighboring Japan, and as a result, Japan and Korea, both U.S. allies, have historically been able to work together towards the common goal of stabilizing the Korean Peninsula. The situation changed significantly in the early 2010s, however, as China rapidly strengthened its naval power. The focus of the U.S.-China confrontation has now shifted from land to sea, including the South China Sea. As a result, the Korean Peninsula, once strategically vital in the land-based confrontation, became considerably less significant. The U.S. and Japan shifted their focus to the sea, and strategic interest in the Korean Peninsula began to wane. Under the new Kim Jong-un regime, thinking began to shift on the Korean issue, hitherto seen as a single issue under the powerful control of China, with the result that China and North Korea have come to be regarded as separate issues. The separation of the “China issue” and the “Korean Peninsula issue” meant that Japan and Korea no longer shared common strategic goals. While Japan has a territorial dispute over the Senkaku Islands and remains vigilant against China’s expansion into the East China Sea, South Korea needs China’s cooperation on the Korean Peninsula issue and has growing economic dependence on China. As a result, cooperation between Japan and South Korea in the security realm has become increasingly difficult, and both sides have begun to face off against each other in Washington to gain the support of their mutual ally. In other words, the United States is no longer a link connecting its allies Japan and South Korea. Rather, each country is seeking support from the United States for itself individually, and Japan and South Korea have become rivals. This rivalry has sometimes led to political “settlements.” The conclusion of the South Korea-Japan agreement over the “comfort women” issue in favor of Japan, backed by strong U.S. pressure, was clearly a diplomatic victory for Japan in Washington. This settlement led the Moon Jae-in administration in South Korea, inaugurated in 2017, to revise its diplomatic strategy toward Washington and go on the diplomatic offensive. In the same year, South Korea succeeded in getting the new U.S. President Donald J. Trump to enter into a dialogue with North Korea, an outcome that had been sought by Moon himself. Japan’s insistence on maintaining a firm stance against North Korea led to it becoming isolated. 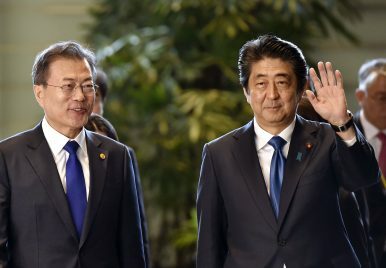 The South Korean presidential office, on the other hand, gained confidence, to the point where there was a unique sense of elation that consideration of Japanese influence was no longer required. However, following the breakdown of the second US-North Korea Summit in Hanoi, the situation is changing once again. Importantly, South Korea overestimated its influence. That is to say, the South Korean government thought that its influence would be enough to bring the U.S. and North Korea to the negotiating table, and that negotiations would then proceed along the lines Seoul desired. When things did not go as planned, the result was a pervasive sense of disappointment in South Korea. This disappointment is not simply due to the failure of the talks; rather, it is a reflection that Seoul realizes it did not in fact have the influence it once believed it possessed. This could in turn alter South Korea’s stance on Japan. With sufficient influence in Washington, South Korea does not need to consider Japan. If its clout is more limited than expected, however, Seoul needs to change its strategy. It either needs to seek Japanese cooperation in order to augment its own influence, or launch a new offensive to reduce Japan’s continuing influence against dialogue with North Korea in Washington. The latter option includes issues of historical understanding such as the comfort women issue. The failure of the U.S.-North Korea talks could have a major impact on relations between Japan and South Korea. Will the two nations now move back in favor of cooperative relations? Or will new spats ensue? Much will depend on the choices made by the Moon Jae-in administration. Kan Kimura is a professor at Kobe University. A recent maritime incident puts the relationship at a crossroads.